Portable Aerial Work Platforms are specially designed for the working place that always changes and for long distance transportation purpose. The structure is in single mast. The outrigger is detachable. It can be easily loading or unloading on a pickup or truck. Smaller size and titling feature makes the machine be quite suitable for those who need to transport the Aerial Work Platform through narrower and shorter places. It is used for single person aerial working purpose. They are made up of high grade aluminum profile and equipped with the universal wheels, easily pushed around to the designated sites, beautiful structure, compact main body, light weighted, safe and reliable. 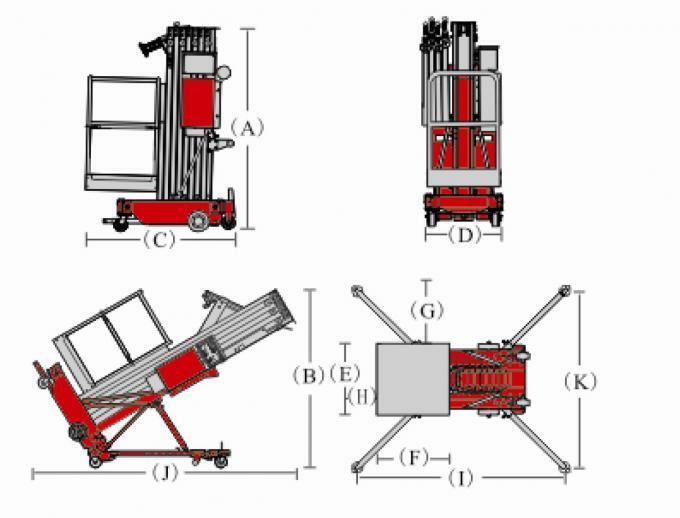 It is operated by the telescopic cylinder which is strong and reliable working and the control panels are available on the lift platforms and ground. It is easily going through the regular doors and elevators, of low energy consumption, no pollution, no damage to the grounds. It is mainly used for the installation and maintenance of the narrow spaces such as star hotels, modern workshops, business hall, hotels, lobby, restaurant, railway stations, exhibition hall and shopping malls, it is a good helper for the equipment maintenance, paint decoration; Easily going through the regular doors and elevators, of low energy consumption, no pollution, no damage to the grounds. 1) Side installation of hydraulic power pack and motor instead of on chassis reduces the size of the machine. 2) Detachable outriggers can be disassembled during transportation and placed in the outrigger socket at the other side of the machine. On one hand it can reduce the transporting size, on the other hand it can avoid impingement to the outriggers during transportation and tilting.